Coding for spinal procedures can feel as difficult to us as performing the surgery itself. Between deciphering the operative note to determining if the procedure should be reported as a stand-alone code or as a piece of another procedure. Understanding bundling edits and rules for reporting instrumentation sometimes causes additional challenges. 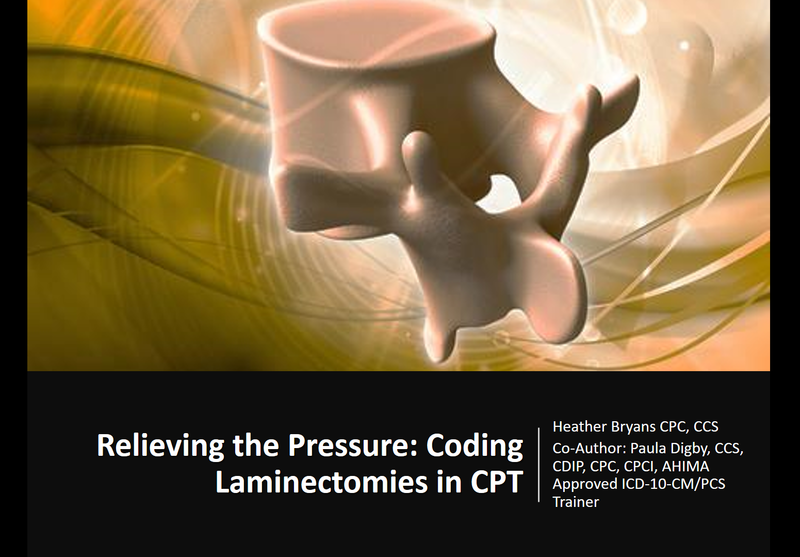 In this session we will relieve some of the pressure of coding laminectomies by taking it step by step and showing you just how pain free coding laminectomies can be. Understand and be able to correctly apply the CPT Code options and modifiers for laminectomies. Understand and explain best practices in the documentation of laminectomies which will aid in correctly reporting. Understand and correctly apply CMS rules and regulations and NCCI edits for laminectomy procedures.